Gout is a disorder of purine metabolism characterized by deposition of uric acid crystal in joints and periarticular tissue. Gout is one of the 3 crystal deposition disorders. 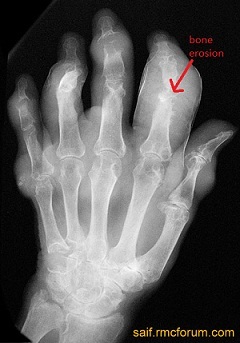 Other crystal deposition disorders are ‘pseudo gout’ and ‘calcium hydroxyapatite deposition disorder’. Gout is of 2 types. Drugs: hydrochlorothiazide, cyclosporine, ethambutol, pyrazinamide etc. Exogenous (30%): from purine rich diet such as liver, brain, kidney, heart (in short, all organ meats). Disorder of purine metabolism causing hyperuricemia. Deposition of sodium urate crystals in articular and periarticular structures. There is erosion of bones and cartilages. Pannus (Granulation tissue) formation within joint cavity. Irregularity of articular surface may lead to secondary osteoarthritis. Sudden onset of severe sharp pain in affected joint. Usually gout appears first in metacarpophalangeal joint of great toe. Pain lasts for hours to weeks. Pain is so severe that patient may not allow even to touch the affected area. Tophus formation in various areas of body. Size of tophi may be 2-20 cm. Arthrocentesis and examination of joint fluid under polarized microscope to see urate crystals which are small rod or pin shaped.